You will play a key role in a pet's journey to his or her new life! Foster an animal...save a life. If you live in or near Roswell: One of the most important things you can do to help the Roswell NM animals is to foster a dog, cat, puppy or kitten. We help rescue organizations pull hundreds of animals from the shelter. These rescues are located elsewhere in New Mexico or are in another state. The animals just pulled from the shelter need a bit of additional time, rest, recuperation, vaccinations, health certificates and/or other medical care or socialization before they are ready to be transported to the rescue organization. Meanwhile, the rescue organizaitons need a little time to secure fosters in their immediate area. In addition, many rescue groups require at least 14 days in a temporary foster home before they are transported. Or, what often happens, is that we save a dog or cat about to be killed who doesn't have a rescue committment - we provide all the vetting and then need the time in foster care to to either get the dog/cat ready for adoption or find space in a partner rescue in order to increase their chance of adoption in more populated and affluent areas. We depend on our dedicated foster families to fill this gap and give these animals a quiet respite away from the hubbub of shelter life until they are ready to be transported to the next stage of their journey or adopted directly by us to a loving family! If you live outside of Roswell, please also consider registering to be a foster - often NM and out of state rescues can only accept animals into their program if there are fosters available in their local area - which just be might be where you live. Also, from time to time short-term fosters are needed in cities throughout NM and other states until the rescue is able to take the animal into their program. 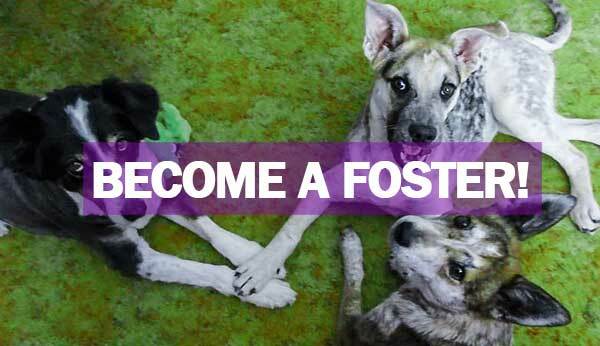 So we encourage anyone interested in fostering, no matter where you live, to sign up! It is such a rewarding experience to know that you've helped a pet in his journey to a new happy life! They all need a helping hand. Kittens, adults and teenager cats all derserve a forever home. Mother cats with litters of kittens need the benefit of being in a home during that critical newborn stage. And, at times, kittens and adult cats can succumb to stress-related upper respiratory illness and just need a couple of weeks to feel well again. Puppies and adult dogs also need a helping hand. Mother dogs with litters of puppies need the calmness of a foster home to thrive prior to being tranpsported to their rescue. Older puppies need help with socialization and potty training. And, adolescent or even older dogs may need understanding and a bit of help with behavioral training. Fostering is a fun and rewarding way to volunteer as a family and volunteer from home! This is a perfect way to get children and young adults involved in animal care and humane education. And, if you currently don't have any pets, it's a great way to enjoy animals without the lifetime commitment. The FORA Foster Handbook helps prepare you for fostering and answers many questions on welcoming your new little fury guest to your home. Foster Coordinators are your support network. They will meet with you to learn more about your family and current pets - making sure to match the temporary foster with your preferences and own pets. They also make sure you have the necessary supplies and are always available to answer questions or assist you.